When traditional metal brackets were the only option for correcting teeth, some teens and adults felt as if their quality of life suffered. They had to be careful what they ate, avoiding foods on the “braces blacklist.” If they played a wind instrument, that hobby was put on hold until the end of treatment. And for those involved in sports, there were ample warnings about the dangers. When Invisalign came along, it was a game-changer for musicians, food lovers, and sports enthusiasts. Find out which sports are safe to play with Invisalign and which ones to play without the aligners. Do you play a sport that usually doesn’t involve much impact to your body? Football, tennis, and basketball involve limited bodily contact, but usually aren’t very rough. Athletics, cycling, and gymnastics may involve some impact or jarring as well, but these activities are usually not too traumatic for the mouth and jaw. 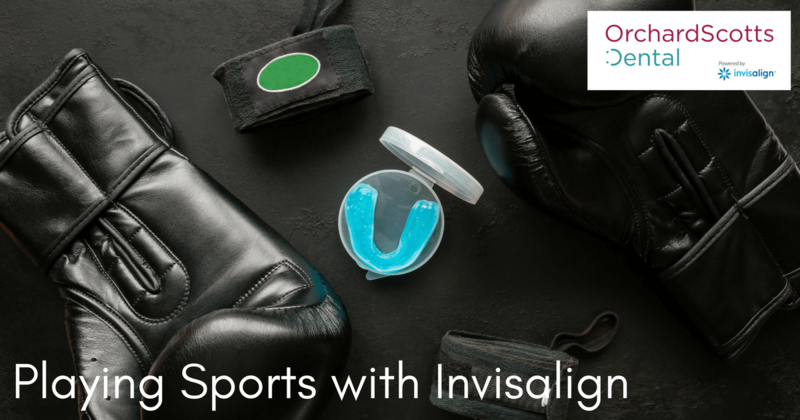 For gym sports or light contact sports like these, you are probably safe to wear your Invisalign trays during the games and practice sessions. There are a number of sports that involve full-body contact. American football, hockey, rugby, and polo can sometimes be violent. If you play these high-impact sports, you might have your aligners knocked out or broken. For other activities such as wrestling, boxing, and martial arts, it may not be wise to wear your aligners. If in doubt, take them out before the game or the practice session. Remember to place your aligners in a hard case inside your bag. If you have to wear a gum shield or a mouth guard as a requirement of the sport, simply take out your aligners ahead of time. Don’t try to wear both your Invisalign trays and the mouth guard at the same time. You may be tempted to skip the mouth guard; but if you feel reluctant to wear it, just remember the amount of time and money you have invested in your teeth. It’s worthwhile to wear that extra device if it protects your investment. If you find that you are having to take your aligners out frequently for hours of practice and lengthy games, discuss the situation with your Invisalign Singapore provider. Your dentist can advise you about how the frequent removal of your trays might affect the length of your treatment timetable. As you know, Invisalign aligners should be worn 22 hours a day and removed only when you are eating. Of course, your Singapore dentist will understand that there are some situations when you might have to take the aligners out. Make sure you keep these occasions to a minimum so you don’t have to extend your treatment by weeks or months. Are you ready to enjoy the flexibility and benefits of Invisalign? Contact Orchard Scotts Dental, a top dental clinic in Singapore, and we’ll be happy to get you started with your smile makeover. With the technology of Invisalign, you can live the life you want and continue the activities you enjoy, all while correcting your teeth and achieving a beautiful smile.